Shuffleboard is a time-honored tradition that began in England in the 15th century. Introduced to America in the late 19th century, it was at first a game played exclusively in the wealthy homes of the U.S. East Coast elite and the West Coast movie stars. They played on custom made tables crafted by famous furniture makers of the time. At The Shuffleboard Federation, we maintain the game's style and elegance, but do our part to bring this favorite pastime to all ages in every walk of life. For both professional matches and leisurely gaming at home in your den or game room, we offer these first-rate American Shuffleboard weights. An excellent game requires a quality set of pucks. We carry the American Shuffleboard brand, which are regulation size (2-5/16 inches) and designed for durability and precision. 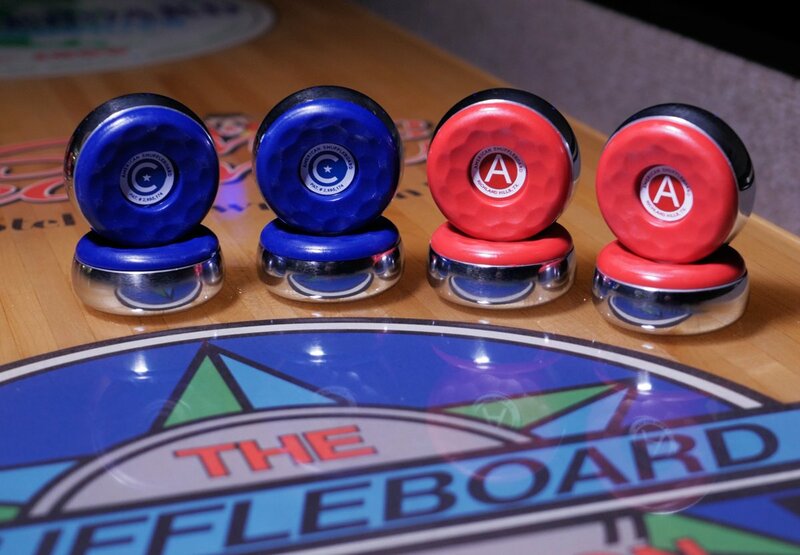 American brand shuffleboard weights are made in the USA and feature screw-on interchangeable caps. They come in a set of 8 pucks, 4 red and 4 blue.